The Gooferment is the worst way to organize society. Perhaps “we” can use this as a “teaching moment” and do so much better. At the very least, “we” should look around ourselves and get organized for when it happens to “us”. I mean “personally”. If there is any type of disaster, do “we” know who will need our help. And, why should we wait for a disaster to trigger “charity”? What about the folks who may need our help now? It might be as simple as calling on a lonely old neighbor, doing a chore for someone — young or old — who can’t for some reason unable to do it themselves, or maybe giving a few buck to the Salvation Army as opposed to the Big Charities with highly paid CEOs. Born August 16, 1919, died peacefully on July 28, 2017. A proud graduate of Manhattan College and Cornell Law School, he loved his daughters, his son-in-law, his grandchildren and great- grandchildren, and his daily New York Times. I believe that Frank is a member of the Class of 1941. Fordham UniversityClass of 1982 J.D. Bridgeport School of Law at Quinnipiac Class of 1993 J.D. Manhattan College Class of 1988B.A. Associate Professor of Emergency Medicine in Clinical Medicine at Weill Cornell. Adjunct Associate Professor of Clinical Medicine, Columbia University College of Physicians and Surgeons. M.D. 1986, Ross University School of Medicine and Veterinary Medicine (Dominica, WI). Kenneth Dowden Rees of New City, NY, 88 years old, passed away peacefully on October 2nd, 2017. He was born on June 19th, 1929 in Bronx, NY to Stanley D. and Elsie Rees. He graduated from De Witt Clinton High School in 1947 and graduated from Manhattan College in 1951. He served in the US Army in the Korean Conflict. After returning from war, he married the love of his life, Patricia Altritt, who predeceased him on October 20th 2014. He was part of the Clarkstown Auxiliary Police and was also an active member of St. Augustine's Roman Catholic Church where he served in many capacities, including Eucharist Minister, Holy Name Society and the Knights of Columbus. Ken's love for baseball dates back to the days of the Brooklyn Dodgers and later he became an avid New York Yankees fan. His hobbies included playing racket ball, traveling and catching up on the daily news, but his greatest joy was spending time with his family. He took great pride in helping to design the home that Patricia and he lived in for 61 years. He is survived by his two daughters, Joanne (Michael) McCue of Pearl River, NY, Mary (William) Arther of Baltimore, MD and his son, James Rees of Atlanta, GA. He is also survived by his 8 grandchildren; Shannon (Ryan) White, Colleen (Brendan) McLaughlin, Caitlin McCue, Douglas and Kyle Rees, Daniel, Megan and Matthew Arther. He is also survived by his 5 great grandchildren; Abigail, Liam, James, Jaedyn and Brady. Ken is survived by his brother Jim (Debbie) Rees of Calabash, NC. He was predeceased by his brothers, Robert and Stanley Rees. In addition, he is survived by many nieces and nephews. In lieu of flowers, memorial contributions can be made to The ARC of Rockland, 25 Hemlock Dr, Congers, NY 10920 and/or the Marian Shrine in Stony Point, 174 Filors Ln, Stony Point, NY 10980.Family will receive friends on Thursday, October 5th from 3pm-8pm at Higgins Funeral Home in New City, NY. A Mass of Christian Burial will be held on Friday, October 6th at St. Augustine Church, New City at 10am followed by an interment at Gate of Heaven Cemetery in Hawthorne, NY. Alumni, family and friends living in or visiting San Diego are invited to join the College for an evening cocktail reception at Coasterra (880 Harbor Island Dr., San Diego, CA 92101). 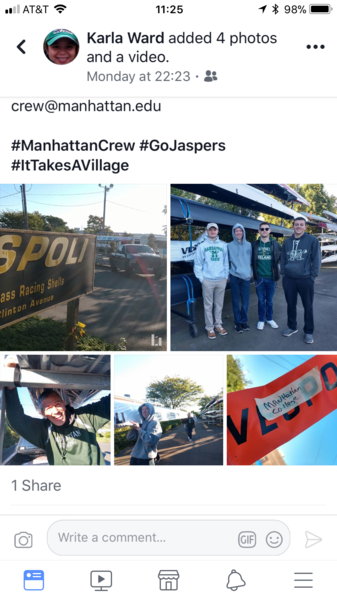 Connect with fellow Jaspers and learn what's new in Riverdale! The event will begin at 6:00 p.m. The cost is $40 per person and includes heavy hors d'oeuvres and an open bar. Advance registration is required. For more information, please contact the Alumni Office at (718) 862-7432 or alumni@manhattan.edu. Manhattan is excited to share that the Honor Roll of Donors is now available online and can be viewed at manhattan.edu/HonorRoll. Each gift to the College represents a commitment to the excellence and legacy of this institution. The support we received last fiscal year (July 1, 2016 – June 30, 2017) from alumni, parents, faculty, staff, and the extended community truly enriches the lives of our young men and women. The Jasper family is proud to thank – and honor – every donor who dedicated time and resources to Manhattan College’s deserving students. Thomas passed away on Wednesday, October 4, 2017. Thomas was a resident of Doylestown, Pennsylvania at the time of passing. Tom was a graduate of Archbishop Stepinac High School of White Plains, NY and attended Manhattan College. 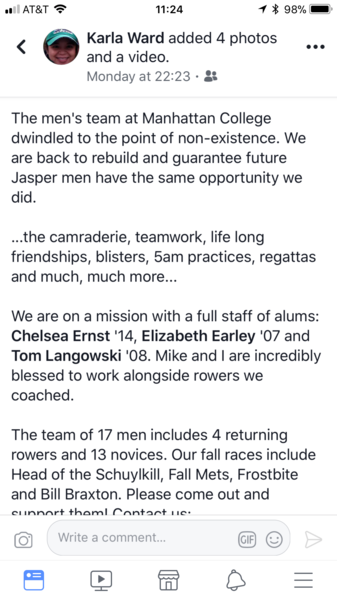 A memorial gathering will be held at the Varcoe-Thomas Funeral Home, 344 North Main Street, Doylestown, PA 18901 on Friday, October 6th from 7:00-9:00 pm. A funeral mass will be held at Our Lady of Mount Carmel Catholic Church, 235 East State Street, Doylestown, PA 18901 on Saturday, September 7, 2017 at 11:00 am. In lieu of flowers, memorial gifts to the Lewy Body Dementia Association, 912 Killian Hill Road S.W., Lilburn, GA 30047 or www.lbda.org would be appreciated. Arthur passed away on Monday, October 2, 2017. Arthur was a resident of Massachusetts at the time of passing. Mr. Landy was born in Ossining, NY, attended Ossining High School, and graduated from Manhattan College in 1953. He served in the US Navy during the Korean War and participated in the blockade during the Cuban Missile Crisis in 1962. His funeral mass will be held at Sacred Heart Church, 62 School St., Manchester by the Sea, Friday, October 6, 2017 at 11:30 a.m. Visiting hours will be held at the Campbell Funeral Home, 525 Cabot St., Beverly on Thursday, October 5, 2017 from 4 to 7 PM Burial in Pleasant Grove Cemetery, Manchester by the Sea. In lieu of flowers, please donate to Sacred Heart Parish in 62 School St., Manchester by the Sea , MA, or Care Dimensions Hospice 75 Sylvan Street suite B-102 Danvers MA 01923. Donald was born on December 5, 1933 and passed away on Tuesday, October 3, 2017. Donald was a resident of Seneca, South Carolina at the time of passing. Don graduated from Baldwin High School and went on to earn a Bachelor's Degree from Manhattan College. He always dreamt of entering the Navy, but instead, was called to serve in the United States Army for 2 years, serving 1 year as Captain of a 60 mm Mortar Squad in Iceland. Services will be held at 10 AM on October 10, 2017 at Ramsey Creek Preserve, 390 Cobb Bridge Rd., Westminster, SC. Many of you know Joe Ryan '81 & '86, Associate Head and Track Field Coach M & W, at Manhattan and Hall of Fame Chair. Joe will be going into Hospital on October 20, 2017, for Cervical Spine Surgery. Please raise the volume for Joe as we pray for a successful surgery free of complication so that Joe is quickly on his feet and back to his Family, Friends and the Manhattan College Community. We ask God to guide the Surgeon's hand as Joe is operated upon. Joe, you are in our prayers and in our thoughts. God Speed. Shelton resident, John Corraro, will star in Center Stage Theatre’s upcoming production of “I Hate Hamlet” which opens this Friday (Oct. 6) at the newly named Richard O. Belden Cultural Center at 54 Grove Street. Corrao plays television star Andrew Rally who has just moved into a ritzy apartment in Manhattan so he can start rehearsals for his New York debut as Hamlet. There’s only one problem—he hates Hamlet—and fears tackling the epic role. When the ghost of John Barrymore shows up to help him prepare for the role, he’s in for the ride of his life. “The production is great fun, and you don’t have to know anything at all about ‘Hamlet’ to enjoy it! It’s simply a hilarious funny play about a person who has been put into a situation he is not comfortable with, and being convinced to follow through by a ghost!” Corraro said, with a laugh. A veteran of Center Stage, Corraro started performing at the local theater as only a seventh grader when he appeared in Neil Simon’s “Lost in Yonkers.” He went on to appear in numerous productions for Center Stage, most recently playing roles like Javert in Les Miserables and Kevin in In the Heights in Youth CONNection productions for the theater. 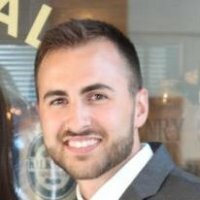 A graduate of St. Joseph High School in Trumbull and Manhattan College, John is a Financial Planner with Barnum Financial Group. He is active in his community, serving on the Board of Directors for Center Stage Theatre and The Foundation for Life. “I Hate Hamlet” plays at 8:00 p.m. on Fridays and Saturdays, from October 6th through October 22nd, at 2:00 p.m. on October 8th, 15th, and 22nd, and at 7:00 p.m. on October 19th. For tickets call 203-225-6079 or visit centerstageshelton.org. John was born on October 28, 1928 and passed away on Wednesday, October 4, 2017. He was a graduate from Regis High School and Manhattan College with and engineering degrees. Missouri: Pro-abortion “Catholic” Claire McCaskill is considered one of the most vulnerable Senators running for re-election next year. I’d give Rand Paul (KY) a pass because he tried to push a “clean repeal” bill that the RINOs rejected.